Diamond blockouts, are they necessary? What is the purpose for diamond blockout and how do they work on slab and columns? That's a great question. One of the reasons for diamond blockouts, they allow the slabs to pour before the main structure is installed. This can be accomplished by forming diamonds around the columns with the pointed corners align with the control joints. 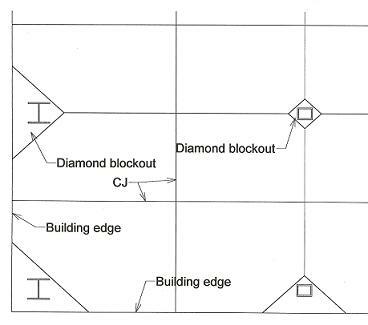 The diagram below is an example of diamond block plan for steel building with wide flange columns and tubular columns but it can be used on concrete column as well. Structurally, diamond blockout are sometimes required to have bond breaker to allow them to move up and down. Due to the heavy loads carried by columns, it can cause the soil directly beneath the spot footings that support the column to settle. Bond breaker will allow the column to slide downwards due to ground settlement without causing damages to the slabs. In the case of expansive soil when wet it will swell. This will cause the footing and column pushed upwards. The bond breaker will allow these movements without damaging the slab or other part of the structure. The requirements are all based on engineer recommendations. The solid lines in the diagram above represent control joints which will be saw cut within 24 hours after the slab is poured. Saw cutting of slabs are done with Due to the brittle behavior of concrete, the control joints are needed to minimize/control where the slab cracks.